The phlebotomy service is managed by Pathology. The team provide a service for hospital inpatients and out patients. Click here for details of hospital clinic services. 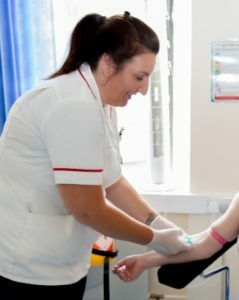 The team offers a community phlebotomy service for GP surgeries. This is arranged through a contract with the Clinical Commissioning Group (CCG). Alterations or additions to this contract may be arranged. Contact the Phlebotomy manager in the first instance Tel: 01892 633266. There is the risk of bruising resulting from having a blood test. Please see the patient leaflet Having a Blood Test 2018 for explanations.